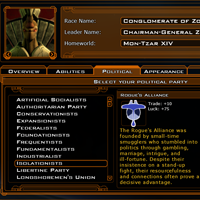 This mod adds Conglomerate of Zod, a stripped version of General Pant's Political Parties (that fits more seamlessly into the game) and Universal Ability Bonuses/Penalties. The Conglomerate does not replace any of the stock races, and is loaded as a regular custom race. Do note that the Conglomerate comes with predefined bonuses and penalties and have all it's points spent. The spent points is how I intended the race to be played, but it's of course possible to reassign the points spent, or just go with the stock bonuses/penalties of the race itself. The Conglomerate of Zod is originally based on the Korx, but with aspects of the Drath and Korath. 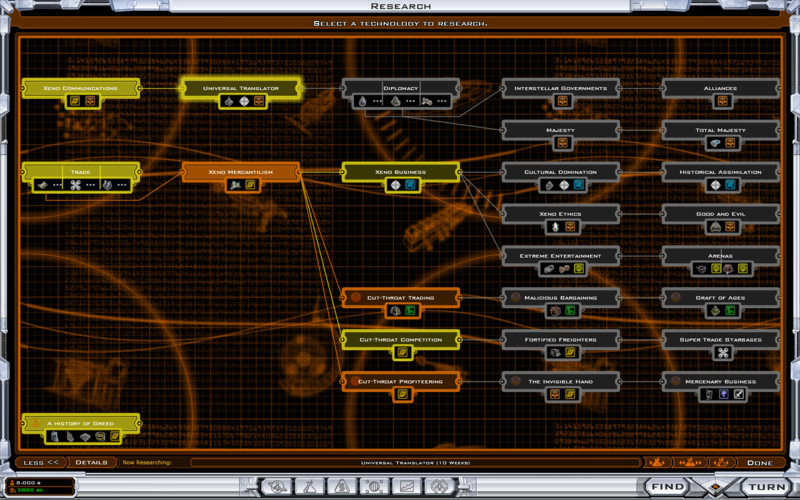 It's got a unique tech-tree and a few changed improvements to match. The Conglomerate folder goes into the mods directory, and the raceconfigxml goes along with the others; straight into the My Documents\My Games\GC2TwilightArnor. The mod have been tested for Twilight of the Arnor 2.0. There may or may not be problems running it with other versions.